I am also starting to make some treats with agave nectar but I'm just starting to use it. If anyone has any helpful tips they would like to share that would be great. 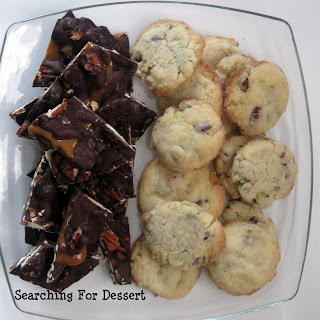 In the picture you see Cranberry Pistachio Cookies and Turtle Bark. The picture isn't that great because it was a quick shot between tiny hands wanting to eat the cookies. The Cranberry Pistachio cookies are made with the same base as the rolled sugar cookies. The difference is I did not chill the dough and I rolled the dough into balls and into sugar, pressed down, then baked them. They were soft and delicious. I used to make a Cranberry White Chocolate Pistachio cookies a few years ago so that would also be something fun, to add some white chocolate chips to the dough. 2. Cream the butter, the ½ cup granulated sugar, and the brown sugar at medium speed until light and fluffy, about 3 minutes, scraping down the sides of the bowl with a rubber spatula as needed. Add the egg and vanilla; beat at medium speed until combined, about 30 seconds. Add the dry ingredients and beat at low speed until just combined, about 30 seconds, scraping down the bowl as needed. 3. Add in the cranberries and pistachios and mix until blended. 4. Scoop the dough into 1” balls, then roll in sugar. Place about 2”-3” apart on a baking sheet. You should be able to fit 12 cookies on a baking sheet. With the bottom of a glass lightly press the cookies to ½”-3/4” thick. You can spray the bottom of the glass with non-stick spray or after pressing a cookie flat then dip the bottom in the sugar if you would like to so it won’t stick to the cookies. 6. Bake for 15-18 minutes until edges are just ready to turn the slightest bit light brown (you really don’t want much coloring at all on these cookies), rotating the pan 180 degrees halfway through baking. 7. Cool on a wire rack and store in an airtight container. *To obtain 1/2 of a large egg, place one egg in a small bowl, stir with a fork until blended then measure out about half of the egg. The other half can be discarded or added to other eggs to make scrambled eggs or used in another recipe.